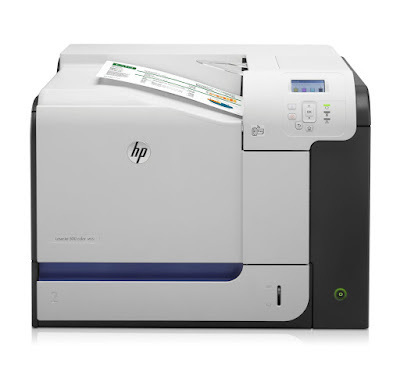 Make an impression with professional quality color and print from your smartphone or tablet with the HP LaserJet Enterprise 500 Color M551n Printer. Consistently update and manage printing capabilities with HP FutureSmart Firmware, and easily manage print jobs and check printer status with the four-line color display. Save money with a printer that ships with a complete set of full-capacity toner cartridges, and save resources with energy-saving technologies. What I offer here is more of a "first impression" after having printed only 545 pages on my new HP LaserJet 500 color M551n printer. I can say that so far, the HP has performed flawlessly. This is a very nice, very well constructed, solid (and heavy) color laser printer. So let me give you some specifics. Going from the box to your point-of-use is not going to be easy. This is a heavy printer (75 pounds but it feels heavier) and most people will want or need someone to help them move it. I helped the delivery driver take it off the truck and walk it into my garage. Then helped me get it out of the box and from there I slowly and laboriously carried the printer up to my office. Once in place though, you'll be printing in no time. Setting up, and connecting to, this printer was easy. I have it installed on my network. I use Windows 7 Home Premium. 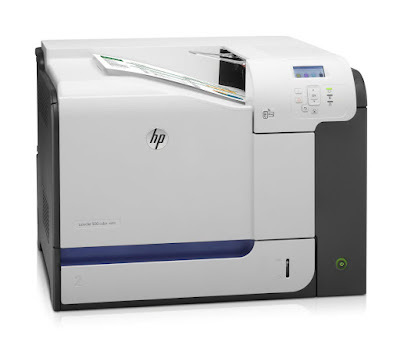 Between my operating system and the HP software the printer is recognized without any difficulty. The software that comes with the printer was not the most current which I found to be only mildly frustrating. But installing updated software from HP's website is straightforward. Image quality is much, much better than I anticipated. In fact, I'll say it's absolutely beautiful. Skin tones, for example, are perfect and there's no banding on a full-page image. And I'm just using plain paper at the printer's default setting of 600 × 600 dpi. I do a lot of PowerPoint presentations with graphs and images and the color/image quality is great. This m551n is very fast. From sleep mode, when you send a print job, the first page is out in 18.5 seconds. If the printer is already awake, it prints the first page in 10.9 seconds. These speeds are based on my sending the print jobs from my notebook computer which is connected wirelessly to my network. I purchased this printer to replace a Xerox Phaser 8650 that simply could not print without regularly producing a paper jam. That was a huge and unacceptable aggravation for a new printer and it is my biggest "anticipated" though, as yet, unfounded fear with my new HP. Based on having owned two Xerox Phaser printers (the 8650 and an 8550 Phaser before that), both of which were highly rated, all I can say is that I will never buy a Xerox Phaser printer again. I'm now an advocate for HP laser printers. If I run into any problems I'll be sure to provide an update. Until then, I think you will be pleased with this printer. The new printer is certainly easy to install and prints like the wind. Print speed is awesome and the paper drawer takes an entire ream at once, also a major convenience. Lovely print quality too. A further benefit is that the toner cartridges are significantly physically smaller than the ones for the 3600n, saving storage space (I keep two sets on hand). We often print documents that contain both landscape and portrait pages. It is mandated by our clients (and regulatory agencies who receive our end product) that when put into binders the landscape pages be oriented with the header at the spine of the binder, that is rotated counterclockwise. Turns out that printing to this thing from MS Word that is not possible. HP online support is not only difficult to get to but did not understand the problem or offer a solution. Their online chat community is much friendlier but also did not have a solution. The workaround is to first print to PDF and then to print to the HP LaserJet 500, but this is ridiculous in an enterprise printer.